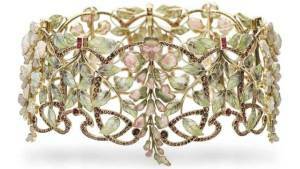 Read this short guide to art nouveau jewelry discussing stylistic elements of art nouveau and designers like Viver, Sandoz, Lalique, Faberge. Large silver-gilt lidded tankard embossed with rocaille work. Set with small cabochon amethysts, emeralds, hessonite garnets, rubies and turquoise. 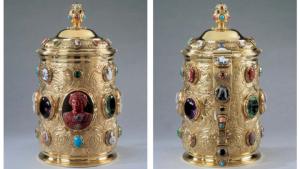 The cameo industry in Torre del Greco in Italy dates back to the 15th century. Read how contemporary Italian cameos are still made in that same way. 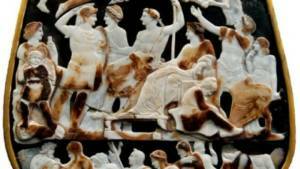 Read the fascinating story of the largest and most elaborate cameo in history. Presumably dating back to around 23 A.D many theories abound on the origin and meaning of the depicted scenes. 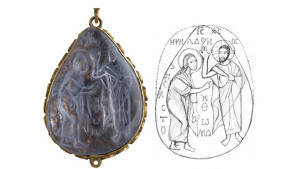 An extensive visual and scientific study of the most important find within the Cheapside Hoard: the St Thomas stone: a Byzantine gem carving in a 16th century pendant. 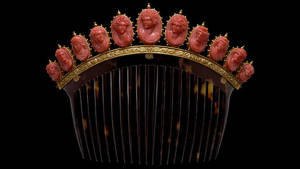 Until now it was unclear what the scene carved in the gemstone depicted.